This is where it all comes together and it either fits or it doesn't. 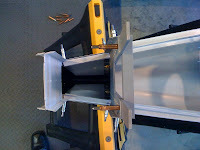 I am worried about the tail spring fitting in assembly, but for now I just need to keep pushing forward. 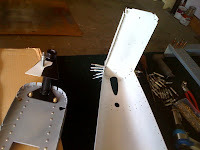 Last night I started the first few rivets on the tail cone. On other sites I have seen some trial and error and learning from them, I think that it is best to start by riveting 710 and 711 to the lower skin first, then fit into assembly. When riveting these bulkheads to the lower skin, I think starting with the inner most rivets on 711 is the way to go, then you can fit the spring over those rivets and all other rivets are reachable with the spring in place. Well, that is my theory, we will see how it goes. Also, here you can see the shim I had to make to get the rear of the tail spring to fit with 711. Quite the work of art when you look at it. Anyway, for some reason I didn't have the clecos in all the way and as I clamped the bracket down, it pushed the bottom skin away from 706 when I drilled. Needless to say, the holes didn't line up on the test fit.. and I put things away for the night to cool down..
"Sorry Sir, but you are the only one to do this boneheaded move. :) Come on in and I will get you another bracket or I can mail it to you." So on my way back to Dynon tomorrow for the replacement and I should have a servo mount in by the weekend. Today was a big day in the shop, but not as much to show for it as I had hoped. First I started on the tail cone skin, opening up the hole in the bottom for socket access later when installing the tail wheel spring. I also used the template from the plans and traced and cut out the slot where the tail spring exits the tail cone. This took quite a bit of time filing and sanding, test fitting, to get it the way I wanted it. Turned out pretty good. 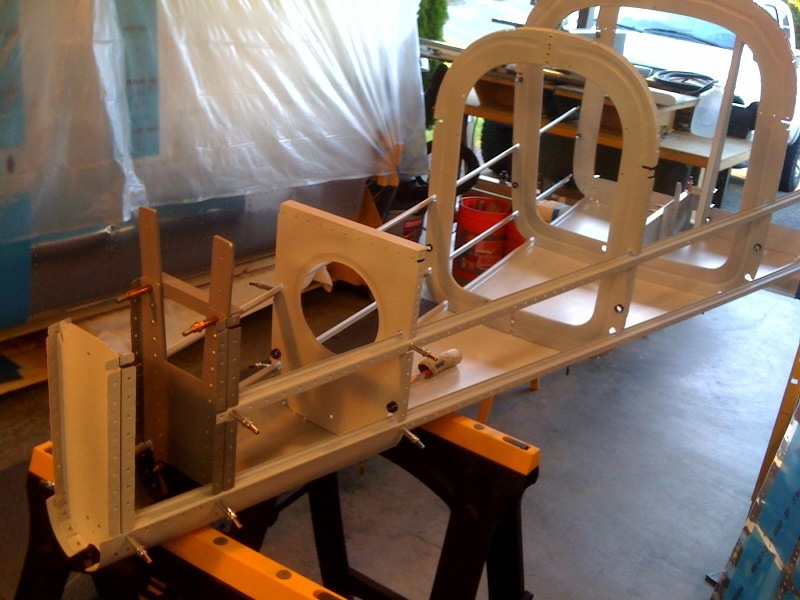 Then onto the tail spring assembly and fitting it between bulkheads 710 and 711. You start by using the bottom holes in 710 that were left open from when the bars were riveted on as a guide and center the end of the tail spring assembly on the bottom of the bulkhead. I drilled it with the #30 first, then opened it up to 1/4 for the AN4 bolts. Turned out well, until I tried to put on 711. Turns out that my tail spring assembly was welded crooked. VANS AIRCRAFT NEEDS TO HIRE BETTER WELDERS.. The directions say to shim any gaps, but it is pretty hard to shim something as twisted as this was. I did my best and think it will turn out just fine, but it so easily could have been welded correct to begin with.. Oh well. Once the shim was fitted, I drilled for the retaining rivets that hold the rear of the spring until the vert stabilizer is mounted permanently securing the rear of the spring. 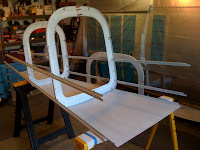 Once all said and done, The aft body came together well, and I was able to verify it was plumb by using the plumb bobs hung from the tooling holes..
Moving right along with the bulkheads. I pushed through a majority of the work on 710 and 711.. These bulkheads are basically two pieces each riveted together back to back. Together each one becomes pretty strong which is important in this area since they support the tailwheel assembly, empennage, and the rear of the plane. I still have to cut out the web on 710 but other than that and the general prep and priming I am about done. Stuck them into the cone for looks and am excited how it turned out. I also got the parts I was waiting for to complete 705 so I should be able to get that done over this weekend. Also, I noticed on 706 that since I am going to be adding an autopilot, I should have left a few rivets open on the lengthwise rib which I will now have to drill out. The servo mount assembly leveraged existing holes from where the angle is now riveted on.. Oh well, I will wait until just before I rivet the bulkhead into the assembly. This week I am going to go back and tackle some of the things that I need to catch up on. Finish F-705, continue to work on the other bulkheads and get them primed. It will be lots of odds and ends for the next week or so, before I get to start drilling and working on this big structure. One thing I noticed about the rear bulkheads is you need to widen the slots for the longerons, also, drill out pitot static mounting holes on the top of F-708, and drill pitot static pass throughs on 07 and 08. Also, don't forget the 5/8 inch holes for the rudder cables and additional for electrical. Still lots of attention to the seemingly easy bulkheads. While I am waiting for a few more F-705 parts its time to start F-706. The bulkheads get simpler and use thinner material as you go further back into the Fuse.. That is until you get to the tail wheel section.. Here are all the parts (I think) for F-706 that I have rounded up. Some of this metal is pretty thin.. Will take some work to get it to lay flat and look good. Couple days later, I went ahead and moved forward without the camera. Basically I fabricated and match drilled and primed all the parts. There are some angles that needed to be created, and of course you need to make the 5/8 inch unibit holes fro the electrical and the rudder cables a a few areas that get dimpled for flush rivets.. So far I am happy with how this turned out. Next steps involve riveting, but note that there is a specific order, and you don't set all the rivets now, some go in at a later date.